At Purecoat, we value our employees and recognize their contributions to our success, we know the value of exceptional people. As a result, and in support of our team principles, we are committed to providing a quality benefits package that is affordable and attractive, simple to understand and use, and competitive in the marketplace. We pride ourselves on providing our employees with an environment conducive for productive and long-term employment. 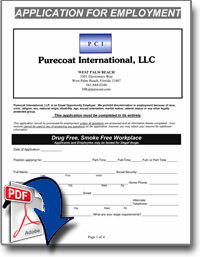 to HR@purecoat.com or FAX 561-844-1033.